Synopsis: A cemetery director discovers that his customers die when he changes the status of their plots from vacant to occupied on the cemetery plan in his office. .
Richard Boone (The Kremlin Letter, The Shootist) plays Robert Kraft, the scion of the small town of Milburn’s wealthiest – and most philanthropic – family, who is saddled with the responsibility of managing the administrative duties of the town’s cemetery. He works from a cottage situated on the perimeter of the cemetery, and on the wall of this cottage sits a map detailing the location of every plot. Those which are occupied are identified by a black pin, while those which patiently await the arrival of their owner are indicated by a white one. It’s a simple enough system, but Robert botches things when he accidentally places black pins on two plots given to a young couple as a rather bizarre wedding present by the groom’s father – a mistake he only realises he’s made when he receives the news that they have both perished in an automobile accident on the very same afternoon that the plots were allocated to them. I Bury the Living flies for 70 minutes as it presents us with a clinical and entirely feasible study of one man’s psychological disintegration under fantastic circumstances. Without respite, it relentlessly forces Kraft to not only doubt his own sanity but to question everything he thought he had known about himself. Why him? What man must he be to possess such a terrible power? 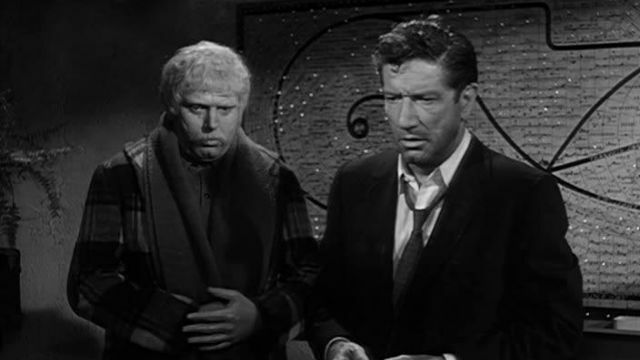 The depth of Kraft’s torment sets him apart from the protagonists of similar movies of the era, and our sympathy for his plight is aided immeasurably by a performance of immense strength and sensitivity from craggy-faced Richard Boone, an actor who was under-rated while alive and has been largely overlooked since receiving his own black pin. 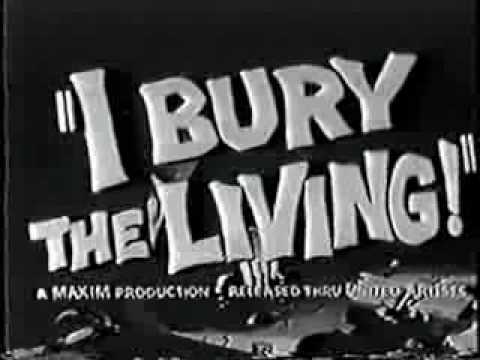 Band directs I Bury the Living as if were a Noir , with slowly enfolding darkness providing a visual indication of Kraft’s crumbling state of mind in the same way that the slowly increasing size of the cemetery map symbolises the way it is becoming the sole, forbidding focal point of his life. As good as I Bury the Living is, it still qualifies as a failure because of Band’s stunningly bone-headed decision regarding that ending. In Louis Garfinkle’s original screenplay, Kraft is confronted by his ‘victims’ when they rise from their graves after he switches their black pins for white, and one can’t help feeling both sad and frustrated about how much better that ending would have been. Band had no way of knowing it back then, but this was his one chance of achieving a moment of greatness in cinema. And he blew it.